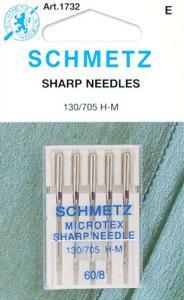 Microtex (Sharp) Size: 60/8, 70/10, 80/12, 90/14, 100/16, 110/18, Assorted Color Code: Purple Feature: Very slim acute point. Fabric Use: Micro fibers, polyester, silk, foils, artificial leather, coated materials. Very thin acute point creates beautiful topstitching and perfectly straight stitches for quilt piecing when precision is paramount.